Action/Adventure/Drama/History/Gainful, USA/Japan, 1970, 144 min. Tagline The incredible attack on Pearl Harbor as told from both the American and Japanese sides. Synopsis Tokyo, 1941. As World War II rages in Europe, a change-of-command ceremony takes place aboard the Japanese battleship Nagato, the flagship for the newly appointed Commander-in-Chief of the Combined Fleet Admiral Isoroku Yamamoto (Soh Yamamura). He takes command from the departing Fleet Admiral Zengo Yoshida (Junya Usami). In Yoshida's cabin, the two of them discuss America's current trade embargo that starves Japan of raw materials including oil due to the war Japan has been waging in China since 1937. While both agree that a war with the United States would be a complete disaster, Army hotheads and other militarlist politicians push through an alliance with Germany and start planning for war, believing the U.S. to be pre-occupied with the war in Europe. Their fear of war increases when Militarist Japan signs the Tripartite Pact with Nazi Germany and Fascist Italy in Berlin, making Japan the third member of the Axis Powers. With the U.S. Pacific fleet at Pearl Harbor, regarded as a "knife to the throat of Japan", Yamamoto orders the planning of a preemptive strike, believing Japan's only hope is to annihilate the American Pacific fleet at the outset of hostilities.When planning the attack, the Japanese commanders debate Pearl Harbor's exposure to a torpedo attack, but realize that torpedoes dropped from an aircraft will fall and submerge at least 75 feet (23 meters) below the surface. Since Pearl Harbor is only 40 feet (12 meters) deep, the Americans feel they have a natural defense against torpedoes. But the Japanese have a plan to overcome this obstacle; they fit small stabilizers to aerial torpedoes, making them effective in the shallow harbor; they also retrofit armor-piercing battleship shells, converting them to aerial bombs effective against the American ships.In a major intelligence victory, American intelligence in Washington manages to break the Japanese Purple Code, allowing the United States to intercept radio transmissions the Japanese think are secret. American intelligence in Washington is seen collecting increasingly threatening radio intercepts and conveying their concern to a White House staff that seems strangely unresponsive. The American response to high quality intelligence in general appears lax, although Pearl Harbor does increase air patrols and goes on full alert well before the raid.Japanese commanders call on the famous Air Staff Officer Genda Minoru (Tatsuya Mihashi) to mastermind the attack.At Pearl Harbor, although hampered by a late-arriving critical intelligence report about the attack fleet, Admiral Kimmel (Martin Balsam) and General Short (Jason Robards) do their best to enhance defenses. Short orders his aircraft to be concentrated in the middle of their airfields to prevent sabotage (leading to a pointed bit of dialogue between two officers when one objects to the order by saying, "Suppose there's an air raid? ")In Japan, Yamamoto tries to avoid an attack and blames the Japanese Army for pushing too hard for war when peace is still an option. Yamamoto stresses that the United States is a mighty foe who would be extremely dangerous to provoke. In order to defeat the United States, he claims, destroying the U.S. fleet or even capturing Hawaii would not suffice Japan would have to invade the mainland and dictate terms of U.S. surrender on the White House steps, an eventuality Yamamoto clearly sees as impossible to achieve.In Washington D.C., diplomatic tensions increase between the U.S. and Japan as the Japanese ambassador to the United States is seen asking Tokyo for more information to aid in negotiations to avoid war, but getting little or nothing to work with in return. Army hothead General Tojo (Asao Uchida), Japan's Minster of War, is depicted as adamantly opposed to any last minute attempts at peace. The Japanese commence a series of 14 radio messages from Tokyo to the Japanese embassy in Washington that will conclude with the declaration of war. But the Americans are translating the radio messages faster than the Japanese embassy. Hence, the Americans know of the attack before the Japanese ambassador informs them.On the morning of Sunday, December 7, 1941 decision makers in Washington and Hawaii are seen enjoying a leisurely routine while American intelligence works feverishly to interpret the coded transmissions and learns the final message will be received precisely at 1:00 pm Washington time. Lt. Col. Rufus S. Bratton (E.G. Marshall), an American intelligence officer working on the decoding, notes that the final message instructs the Japanese Ambassador to destroy their code machines after they decode the last of the 14 messages as well as destroy all written documents at the embassy in preperation for immiment internment... an ominous point. Bratton's frantic attempts to convey this message to American commanders fail because they are enjoying a Sunday of playing golf and horseback riding.Bratton manages to contact his friend, Lt. Commander Kramer (Wesley Addy), about the last part of the 14th message. Kramer then relays it to Chief of Naval Operations Harold Rainsford Stark (Edward Andrews) who is is informed of the increased threat, but decides not to inform Hawaii until after calling the President first... although it is not clear if he takes any action at all.Finally, at 11:30 a.m. Washington time, Colonel Bratton convinces the Army Chief of Staff, General George Marshall (Keith Andes), that a greater threat exists, and Marshall orders that Pearl Harbor (and all other Pacific installations) be notified of an impending attack.Meanwhile in Hawaii, an American destroyer, USS Ward, spots a Japanese two-man midget submarine trying to slip through the defensive net and enter Pearl Harbor. The destroyer attacks and sinks the submarine, and notifies the base. Although the receiving officer, Lieutenant Kaminsky (Neville Brand), takes the report of an attempted enemy incursion seriously, the pompous Captain John Earle (Richard Anderson) at Pearl Harbor demands confirmation before calling an alert. Admiral Kimmel later learns of this negligence and is furious he was not told of this enemy action immediately. Rather then call a high alert, he decides to call for an emergency meeting of his officers at headquarters at 8:00 am.Just after 7:00 am, two U.S. Army privates posted at the remote radar station, Joseph Lockard and George Elliot, spot the incoming Japanese aircraft and inform the Hickam Field Information Center, but the Army Air Forces Lieutenant in charge, Kermit Tyler, dismisses the report, thinking it is a group of American B-17 bombers coming from the mainland, and he is frankly too tired to care after a night of drinking.The Japanese intend to break off negotiations (they do not intend to issue a formal declaration of war) at 1:00 pm Washington time, 30 minutes before the attack. However, the typist for the Japanese ambassador is slow, and cannot decode the 14th part fast enough. So Ambassador Kichisaburo Nomura (Shôgo Shimada) decides to postpone his meeting with the Secretary of State.A final attempt to warn Pearl Harbor is stymied by poor atmospherics and bungling when the telegram sent by General Marshall is not marked urgent; it will be received by Pearl Harbor during the attack. The incoming Japanese fighter pilots are pleasantly surprised when there isn't even any anti-aircraft fire as they approach the base. 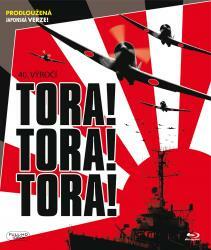 As a result, the squadron attack leader Commander Mitsuo Fuchida (Takahiro Tamura) radios in the code phrase marking that complete surprise for the attack has been achieved: "Tora, Tora, Tora. "Once the Japanese attack planes commence fire, the soldiers and sailors at Pearl and nearby bases respond and return fire, but with surprise achieved resistance against the Japanese planes is desperate and only partially effective. Upon seeing the Japanese low-level bombers, an American officer instructs his colleague to get the tail numbers so the pilot can be reported for safety violations; he thinks they are American aircraft. The sight of the offending aircraft then deliberately dropping a bomb on the base dispels that misconception.The aircraft security precautions by General Short prove a disastrous mistake that allows the Japanese aerial forces to destroy the U.S. aircraft on the ground with ease, thereby crippling an effective aerial counter-attack: all the aircraft on the runways at the major airfields are destroyed spectacularly either as they took off or while they were still parked. Amid the mayhem the force of B-17 bombers Lt. Tyler mistakenly believed was the earlier radar contact, a force commanded by Major Truman Landon, arrives at Oahu per schedule and is immediately attacked by Japanese fighters, forcing the bombers to scatter and try to make emergency landings.Two American fighter pilots, Ken Taylor and George Welch, race to remote Haleiwa and manage to take off to engage the enemy, as the Japanese have not hit the smaller airfields. Taylor and Welch engage several Japanese planes over Oahu and manage to shoot down several Japanese fighters and bombers while escaping scot free.The catastrophic damage wrought by the attacking Japanese air fleet is well detailed, with sailors fighting as long as they can and then abandoning sinking ships and jumping into the water with burning oil on the surface - the sight of the wreckage also enables Lieutenant Kaminsky to deliver comeuppance to the horrified Captain Earle when he arrives at the base and sees for himself the havoc wrought by the Japanese.The pivotal point of the attack comes amid a plethora of torpedo hits delivered to several US battleships - a Japanese bomber, sporting one of the converted armor-piercing shells, closes on its target - identified via a newspaper photo taped to the cockpit's side - the USS Arizona. The bomb lands on the ship's armored deck near one of the main turrets, smashes through, detonates forward magazines, and the malestrom of explosions erupts into one catastrophic blast whose shockwave rocks even the bomber.At the end of the attacks, Fuchida and all surviving Japanese planes return to their carriers to insist a third wave be launched against Pearl Harbor in a late afternoon or evening strike. But the Japanese fleet commander, Admiral Chuichi Nagumo (Eijiro Tono), refuses to launch the third wave of carrier aircraft out of fear of exposing his six carriers to increased risk of detection and destruction from the still-absent US carriers. (Through the years, this action has been debated as having given the Americans a major break in their efforts to recover from the attack. A third wave would have likely struck the large oil tanks as well as destroyed the dry docks and repair facilities, potentially serious blows which could have crippled the U.S. Pacific Fleet for months by themselves.) Despite strong protests by Fuchida as well as most of the naval officers on board the carrier flagship Akagi (including Genda) to mount another attack against Pearl Harbor, Nagumo overrules all of them and orders the Japanese fleet to sail for home.At the end of the attacks, with the U.S. base in flames, its frustrated commanders, Short and Kimmel, finally get the Pentagon's telegram warning them of impending danger. In Washington, the US Secretary Of State, Cordell Hull (George Macready), is stunned at learning of this brazen attack and urgently requests confirmation of it before receiving the Japanese ambassador who is waiting just outside his office. The distraught Japanese ambassador, helpless and at a loss of words to explain the late ultimatum and the unprovoked sneak attack, is bluntly rebuffed by Hull, who coldly replies to the final Japanese communique: "In all my fifty years of public service, I have never seen a document crowded with falsehoods and deliberate distortions on a scale so huge that, until this day, I would have thought no nation on Earth capable of uttering them!" Ambassador Nomura leaves Hull's office to return to the embassy where he and his staff will presumably be detained by the authorities.In the final scene, back in Japan, Admiral Yamamoto is seen lamenting the fact that the Americans did not receive the declaration of war until 50 minutes after the attack started, noting that nothing would infuriate the Americans more. He is quoted as saying: "I fear all we have done is to awaken a sleeping giant and fill him with a terrible resolve."